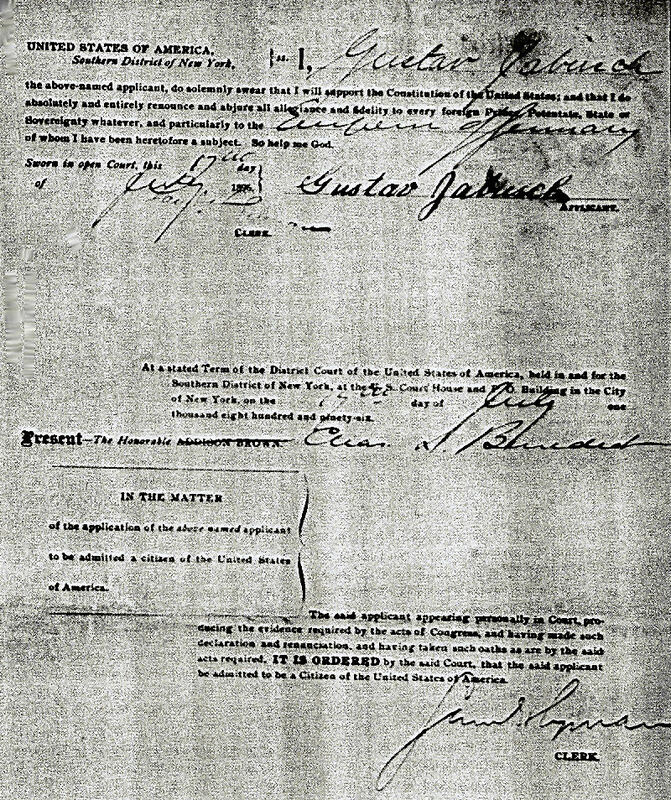 "IN THE MATTER OF THE APPLICATION OF Malcolm McNeill to become a Citizen of the United States. Present. Hon. Henry A. Moore, County Judge. 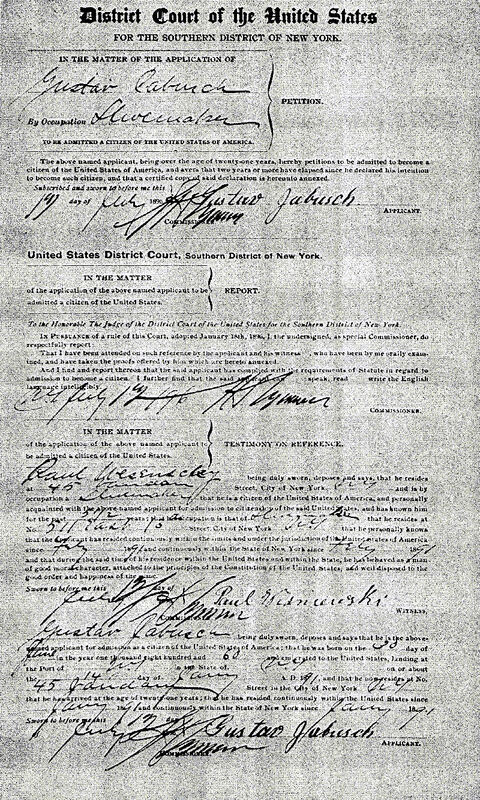 of the City of Brooklyn being duly sworn, says: that he is well acquainted with the above named applicant, and that the said applicant has resided within the United States for the continued term of five years at least next preceeding the present time, and within the State of New York one year at least immediately preceeding this application; and that during that time he has behaved as a man of good moral character, attached to the principles of the Constitution of the United States, and well disposed to the good order and happiness of the same. Sworn in open Court, this __ day of __189_. 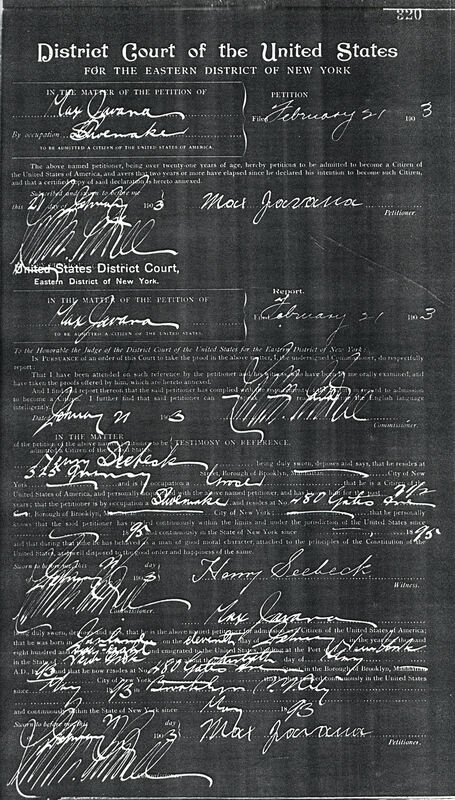 Signature of witness and clerk. State of New York, COUNTY OF KINGS, s.s. 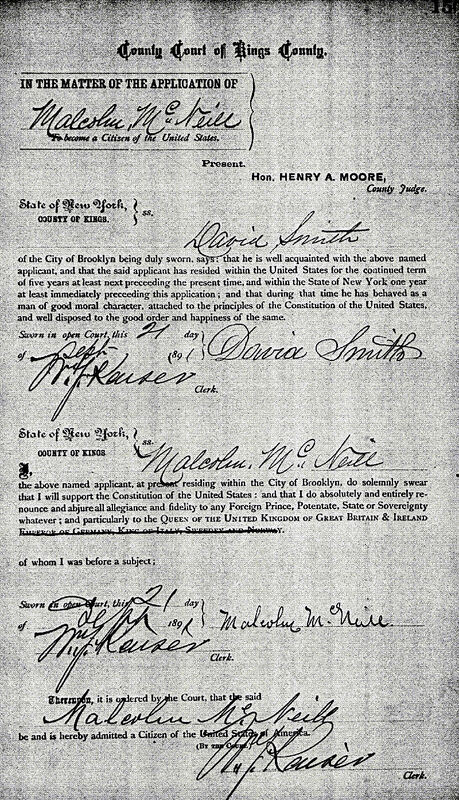 I, Malcolm Mc Neill, the above named applicant, at present residing within the City of Brooklyn, do solemnly swear that I will support the Constitution of the United States; and that I do absolutely and entirely renounce and abjure all allegiance and fidelity to any Foreign Prince, Potentate, State or Sovereignty whatever; and particularly to the QUEEN OF THE UNITED KINGDOM OF GREAT BRITAIN & IRELAND (options to select EMPEROR OF GERMANY, KING OF ITALY, SWEDEN AND NORWAY--whichever is not selected is crossed out) of whom I was before a subject; Sworn in open Court, this __ day of __189_, signed by the petitioner and clerk. 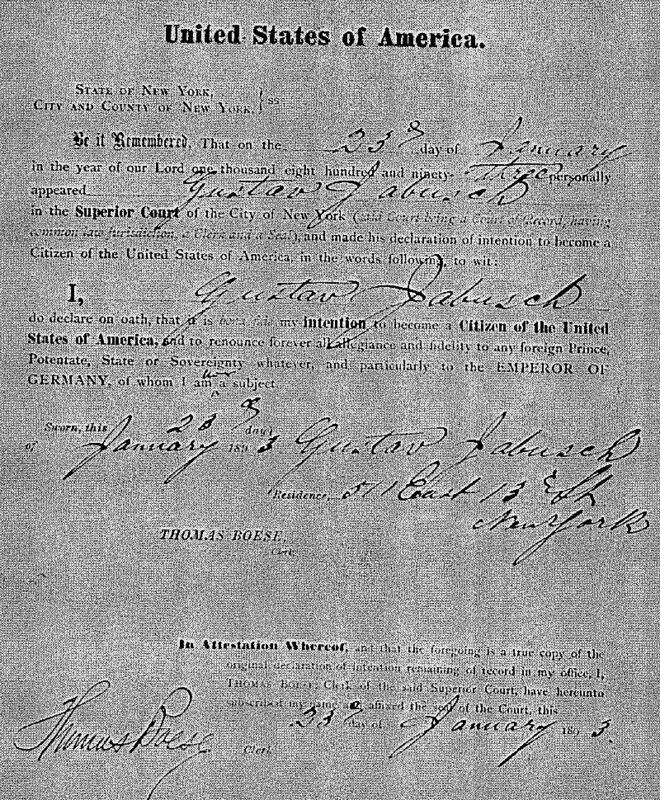 Thereupon, it is ordered by the Court, that the said Malcolm McNeill be and is hereby admitted a Citizen of the United States of America. (BY THE COURT). 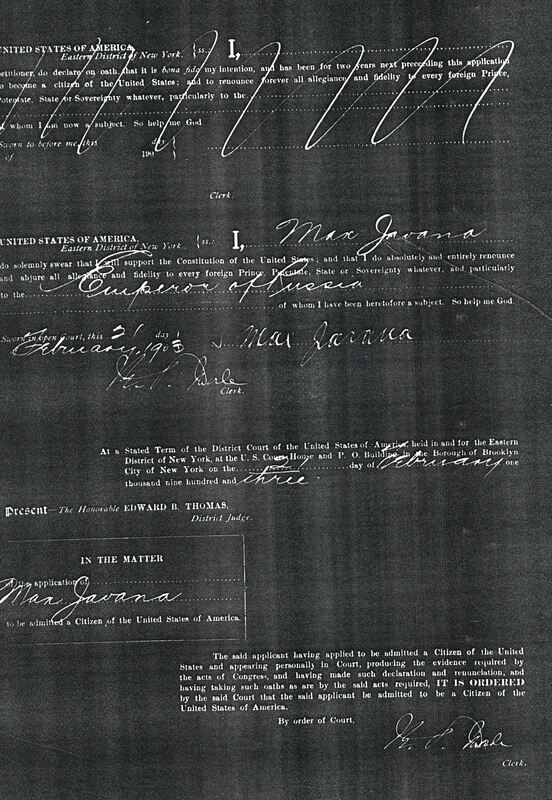 Signed by the clerk." "Present, Justice ___, City and County of New-York, s.s. witness' name of town of residence, being duly sworn, doth depose and say, that he is well acquainted with petitioner's name and that said petitioner's name has resided five years within the United States, and three years next preceding his arriving at the age of twenty-one years, and has continued to reside therein to the time of making this application, and within the State of New-York one year at least; and during this time, he has behaved as a man of good moral character, attached to the principles of the Constitution of the United States, and well disposed to the good order and happiness of the same. Sworn in open Court, this ___ day of ___184_, signed by the clerk and witness. I, petitioner's name and town or residence, DO DECLARE ON OATH, that is is bona fide my intention to become a CITIZEN OF THE UNITED STATES, and to renounce forever allegiance and fidelity to any foreign Prince, Potentate, State, or Sovereignty, whatever; and particularly to the (here, Victoria the Queen of the United Kingdom of Great Britain & Ireland) of whom I now am a subject. I further declare on oath, that for three years next preceding the time of making this Deposition, it has been bona fide my intention to become a CITIZEN OF THE UNITED STATES. I do further declare on oath, that I will support the Constitution of the United States, and that I do absolutely and entirely renounce and abjure all allegiance and fidelity to every foreign Prince, Potentate, State, or Sovereignty whatever, and particularly to the ___ of whom I was before a subject. Sworn in open Court, this ___ day of 184_, signed by the petitioner and the clerk." 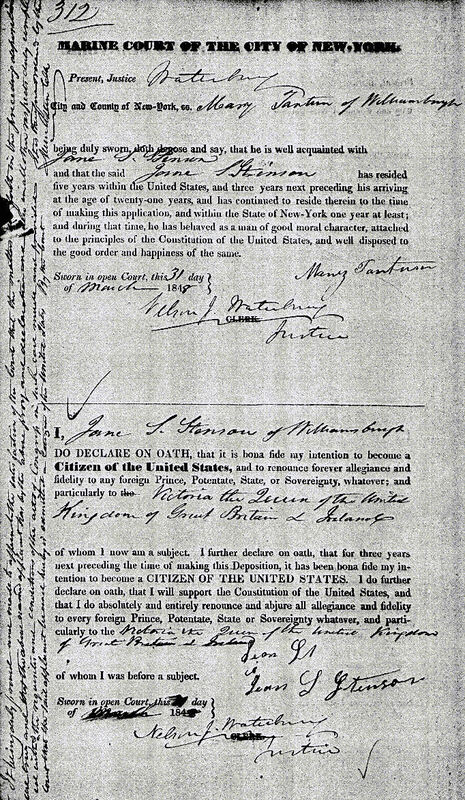 see "In the Matter of Jacob Cohen: On his Naturalization"
Petition and "Testimony of Reference"